But don't let me stop you taking pot-shots. You might have to form an orderly line when it comes to slapping Simon Barnes, though, or form an angry mob. It's up to you. I've always preferred being part of an angry mob myself. Barnes certainly deserves the angry mob treatment. With burning torches, rakes, scythes, the works. "The International Cricket Council cleared Muralidaran's action and even amended the law two years ago to allow a 15-degree flexibility in the bowling arm." But if the ICC cleared the action, why would it need the law ammended? Barnes is a sanctimonious dickhead. 'Stand by for Aussie outrage'?? Ignores the fact that you've been outraged since 1995!! Interesting dilemna for cricket ... #1 wicket taker is a cheat, #2 is a complete tool of a person. I really do wanna have Bishen bedi's babies. Thanks for your opinion Simon. Hey Murali broke the record, let's have a dig at the Aussies. One of the worst articles I've ever read. Please Tone, no more Barnes articles. That guy makes Roebuck, Coward, Conn and co seem like Neville Cardus. Nice heading by the way. The Greg Baum article contains an odd line: "Meantime, he took bags of wickets — 60 in 10 Tests in one stretch..." Murali averages more than 6 wickets per Test over his entire career. I don't have a problem with Murali's action, though I reserve a bit of doubt in the absence of the data on other bowlers. The ICC's reason for not releasing the details of their 2004 study (which led to the 15-degree limit) is player confidentiality. It's OK for a bowler to play in front of tens of millions of telespectators, but if he's watched with a few high-speed cameras, that's an invasion of privacy or something. Great test match by the way. Sangers one of the elite. I echo Yobbo's comment above; "*". Dave, it's not an invasion of privacy, it's purely CYA by the ICC. 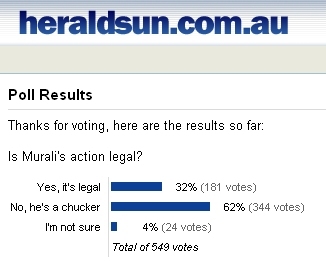 Better get voting if you haven't already - "legal" has a handy lead. Sorry Ian, I should have said "official reason".